I know I’m normally kind of flighty and easily distracted but I have been paying attention to all you folks the past two weeks. For an entry into the Klondike potato giveaway, I asked readers to tell me what they would make with their own bag of potatoes. To my surprise, the top two answers were mashed potatoes and roasted potatoes with some type of herb and olive oil. I don’t know why I was so surprised by this but it made me realize just what a weirdo I am when it comes to crafting recipes and that sometimes, in my quest to create something new and interesting, I may be trying just a little too hard. This aha moment couldn’t have come at a better time. Yesterday was the first day of fall and the start of my favorite season of the year. It’s no longer too hot to turn the oven on, you can sport a sweet scarf without suffocating yourself and one word – BOOTS. I love boots. Even the word is just so fun to say. B O O T S. I hope your workmates didn’t hear you say that out loud unless, of course, they are fashionistas too, in which case they will totally understand and might start chanting with you. I was actually feeling a little apprehensive thinking about the holidays, pumpkin and fall spices. I love these flavors but the pressure of creating something totally unique was kind of getting to me. Seeing all your answers calmed the stormy waters in my brain and reminded me to keep it simple. So I send a heartfelt thank you to you, my friends, for inspiring me. 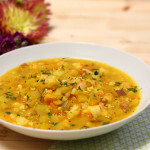 Today’s recipe is definitely a simple one but you can’t inspire all the creativity out of me! I punched it up a notch with some fragrant truffle oil and rustic fresh sage. Forest-y mushroom and sage are decadent fall flavors and marry so well with this perfect comfort food. If you’ve been following along, you’ll know that Klondike Brands and I have partnered together to give away 4 prize packs full of Klondike Potato Goodies, including a cookbook, cooking items and more! Each Monday for the next three weeks I am hosting a weekly giveaway for 1 of these prize packs. Each contest will start on Monday and end the following Sunday night at midnight (Pacific time). Winners will be announced on the following Monday’s post and notified by email. So who is last week’s winner? 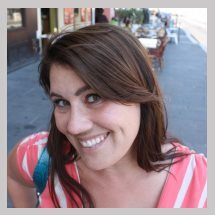 Congratulations to SUSAN CHRISTY! If you haven’t won yet, don’t worry. There are still two more weekly giveaways to go. It’s easy to enter; just follow the widget below. You get 1 entry for leaving a blog comment and up to 5 bonus entries! You can also get a sweet coupon from Klondike Brands HERE. I can’t wait to find out what you would like to make with your potatoes this week! Place the whole potatoes in a medium pot and cover with water. Boil until fork tender (about 15 minutes). Spray a baking sheet with an oil mister (or cooking spray). 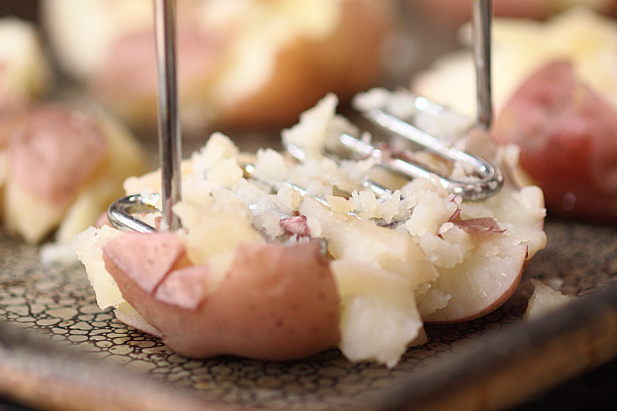 Evenly space the potatoes on the baking sheet and, with a potato masher, gently press down on each to “smash” them. Don’t press too hard, they should still remain intact! 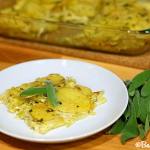 Sprinkle each potato with the salt, pepper and chopped sage. 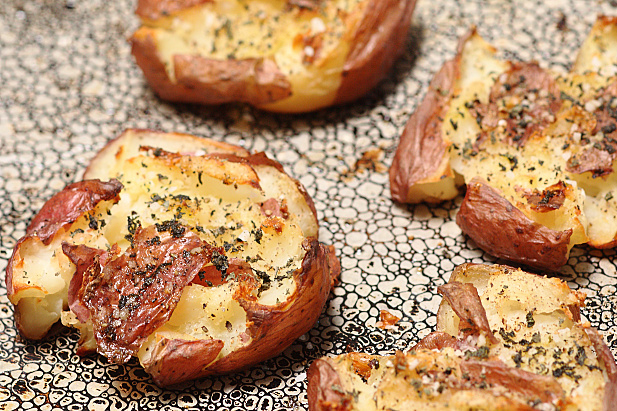 Drizzle the truffle oil over the potatoes. Bake 20 minutes or until the edges start to brown. Serve immediately. 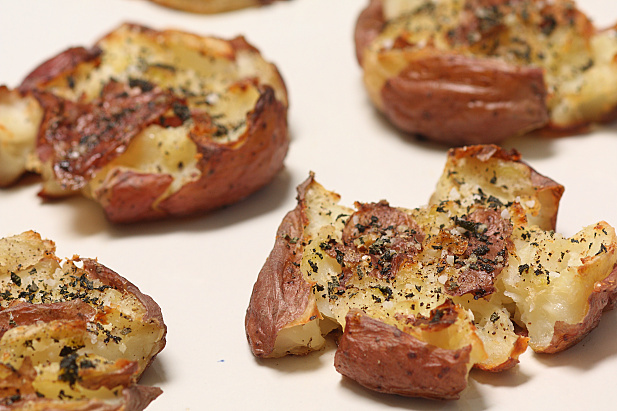 The truffled potato smashers look and sound delicious. Will definately try this soon as I have a lovely sage bush in my herb garden and truffle oil just crying out “use me”. These look so delicious! 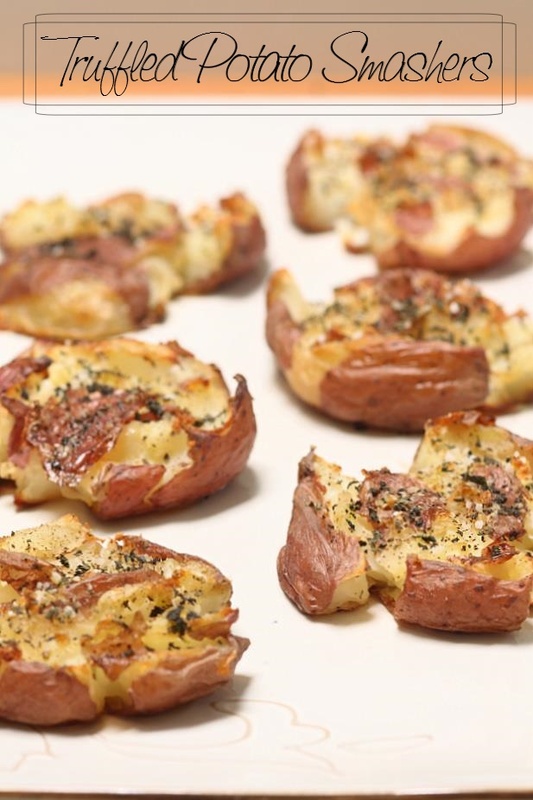 I would love to make some rosemary garlic smashed potatoes. I love anything related to potato and the more potato the better! It is like the SNL skit, more cow bell…more potato! 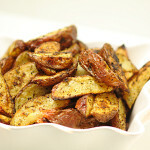 I would make some roasted potatoes w/other root vegetables. 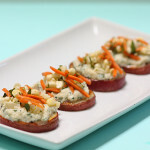 Definitely will try the Truffled Potato Smashers this weekend. Just need to get the truffle oil. I know truffle oil can be expensive but I’ve found good deals at Fresh & Easy, Costco and Trader Joe’s. And I know truffle oil has gotten a bad rap from some chefs (http://latimesblogs.latimes.com/dailydish/2011/06/chef-gordon-ramsay-on-the-one-ingredient-you-should-not-have-in-your-pantry.html) but I could care less. It tastes good so I want to eat it! Now I have an excuse to visit my local oil and vinegar tap room for some truffle oil. 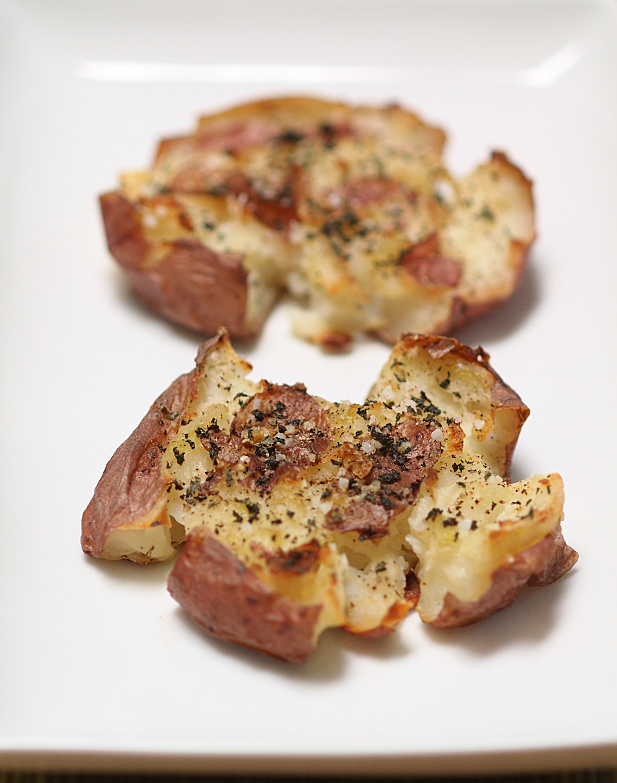 These…I would love to try truffle oil and all of the smashed potato recipes I’ve been seeing are amazing looking. 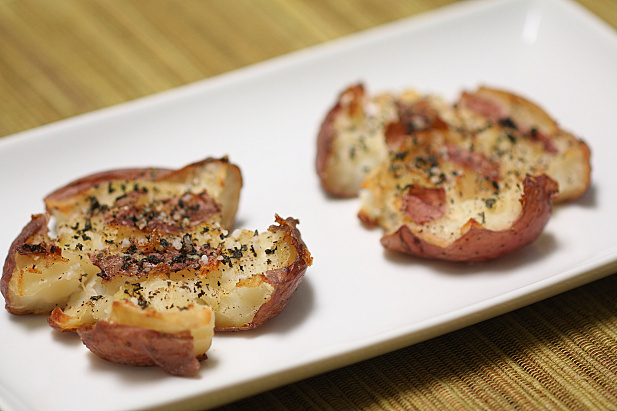 A sort of twice baked potato, but involving bacon, and smashing versus rebaking. Oh yum, I just got a big bag of red potatoes! Now I know what to do with the extras. Anything with sage is wonderful! Do you really mean to boil the potatoes in oil?!? Oh, wow. Yep, you caught me there! It definitely should be water, not oil. Boiling in oil wouldn’t qualify this as a healthy dish now, would it? Thanks for the catch – I have fixed the error. 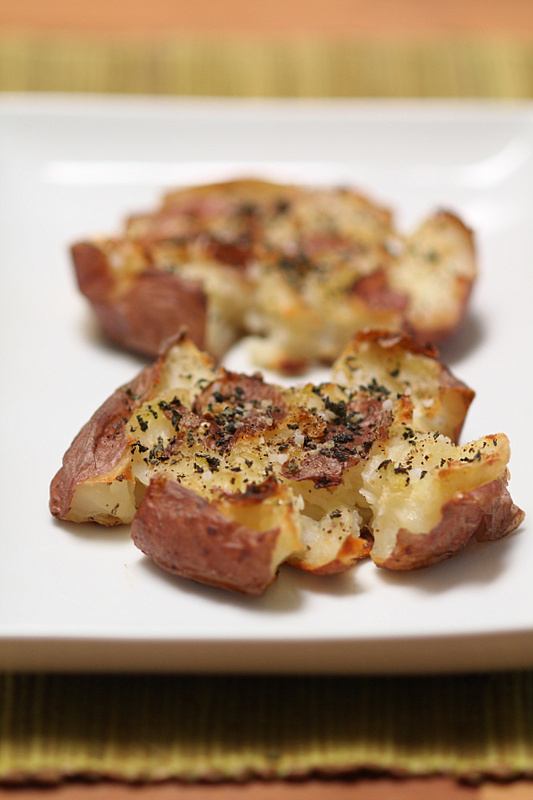 Home » Truffled Potato Smashers and a GIVEAWAY!